I like this oatmeal bar recipe for many reasons. The first and foremost being the ease with which this peanut butter bar recipe can be prepared. 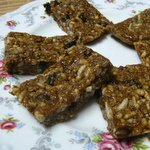 Another reason is that these healthy snack bars are liked by everyone, especially children. Also, there is this satisfaction of making homemade energy bars with the best ingredients that are free of preservatives. These bars come very handy, especially if you are travelling. Whenever you are looking for a quick bite to refill that lost energy, have these snack bars. If your children do not like having slimy oats with milk, this recipe is a good and luring way of giving them oats. Makes about 8-10 slim bars. Grease a 5" x 8" tray. I use a rectangular Pyrex glass ware. Mix the puffed rice, oats, coconut and mixed fruits in a bowl and keep aside. Add both the butters, honey and sugar in a heavy bottom saucepan. Cook on a low flame till the sugar melts, almost constantly stirring. Once the sugar has melted, bring to a boil, cook another couple of minutes, stirring of course all the time. Turn off the gas. Add this to the oats mixture and mix well. Put this to the greased tray and press evenly using a rubber spatula. Refrigerate until stiff. Cut into thin strips. Cling wrap and store in the refrigerator if you are in a hot and humid weather. Leave it outside if the weather is cold. Enjoy a bite, whenever you want!